This handbook is the second in a series that aims to spur local investment in all 50 states. The goal is to provide readers with case studies and information relevant for their state. The first edition, published by the Post Carbon Institute in 2015, focused on Vermont. 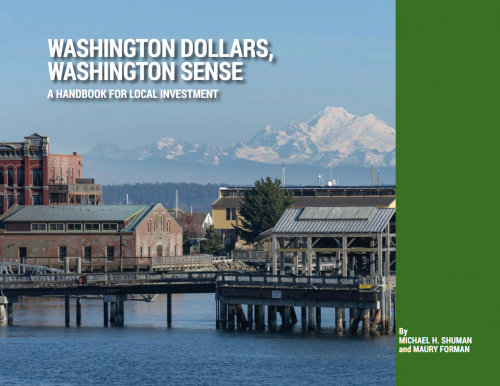 This edition focuses on Washington State, and was produced through the support of the Washington State Department of Commerce and the Sun Valley Institute. Most of the examples are either from Washington or from nearby states. 1. Why should we care about local businesses? 2. Are local businesses competitive and profitable? 3. Why are Americans underinvesting in local businesses? 4. What are the contours of the emerging local investment revolution? 5. What are the risks and returns of investing locally? 1. Tools for grassroots investors looking for local business opportunities. 2. Tools for businesses looking for local investors. 3. Tools for finance entrepreneurs looking to start local investment institutions. 4. Multi-constituency tools which could be used by anyone, including grassroots activists. 5. Legislative and regulatory opportunities available at the state level.